Nancy Ann Carlisle, ca. 1690–1740. Mid-Atlantic region, possibly worked in Philadelphia. du Pont Copeland (1953.0152.007A). Courtesy Winterthur Museum. Samplers and needlework pictures can provide a tantalizing sense of connection to early American history, serving as rare links to the personal experiences of girls and young women of the era. Even more alluring for their mystery are those pieces passed down without signature or documentation, as is the case with a silkwork picture in Winterthur’s collections since the 1950s. 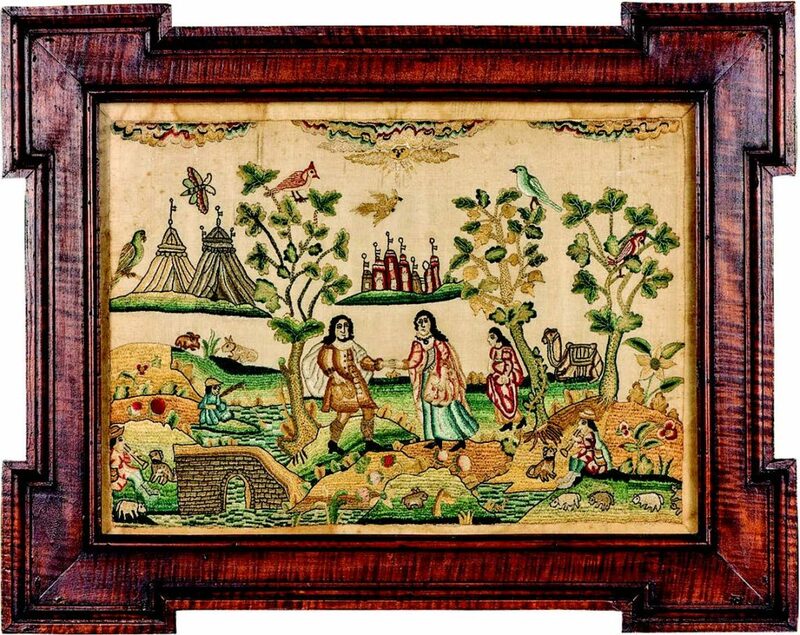 Long said by family tradition to have been made in early eighteenth-century rural New Jersey, this elaborate piece is made still more complex by a reinvestigation of its origins. Both its old-fashioned visual style and its biblical subject are suggestive of seventeenth-century English embroidery tradition (see footnote 1) . Points of comparison include the Stuart-style dress, the simply executed facial features, and motifs such as the rolling hills and distant tents, the abundant small animals and flowers, the anthropomorphized sun, and the prevalence of oak trees with snake-like trunks and lumpy leaves. But what of the family stories that the piece was worked in colonial New Jersey by a girl named Ann Carlisle? Genealogical research reveals nothing to support the traditional creation place. Yet, there are possible connections between the previous owner and an early eighteenth-century Carlisle family, well-off settlers of Sussex County, Delaware (see footnote 2). Given the region’s proximity to Philadelphia, it’s possible that just such an affluent Delaware family may have sent their daughter to be educated in the city (see footnote 3). In further exploring the visual clues, we find additional encouragement for a Philadelphia connection. The picture’s mount represents a powerful piece of evidence (see footnote 4). With the needlework laced to a cedar board through a series of small drilled holes, the mount strongly resembles those of the two Sarah Wistar pictures in Winterthur’s collection and, according to curator Linda Eaton, of other work from the Philadelphia school of Elizabeth Marsh and her daughter Ann (see footnote 5). 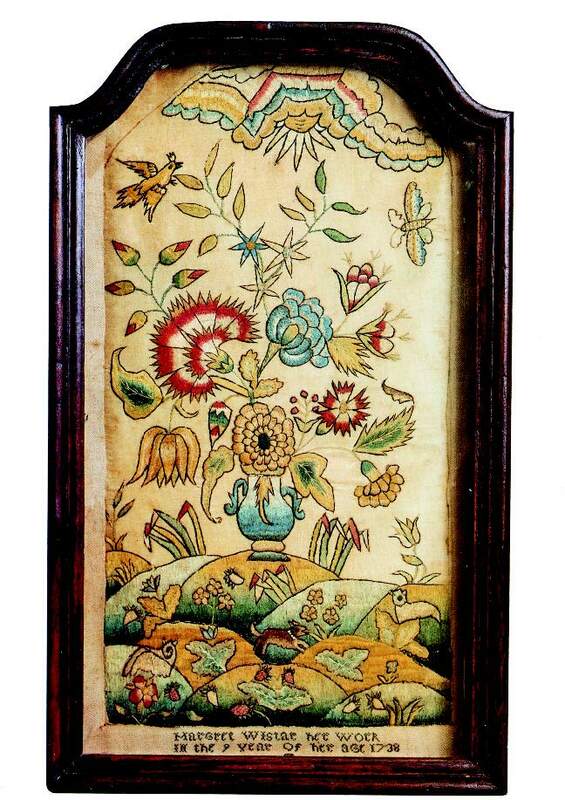 Eaton has argued that mounts and original frames are crucial, and often overlooked, factors in discerning the origins of samplers and embroidered pictures. The piece under discussion may be another case in point, with the mount providing important support for a possible Philadelphia origin (see footnote 6). Striking visual similarities to other Philadelphia needlework pictures strengthen the possible connection to this city, and to the Marsh school, in particular. In a 1738 sconce by Margaret Wistar, sister of Sarah Wistar and a likely student of Elizabeth Marsh (see footnote 7), we see multiple points of comparison (see footnote 2). The treatment of the sun, dog, sheep, and butterfly are all notably similar to these same elements in the present picture. The flying golden birds in particular share the same positioning of body, tail, and wings, the same tufted head, and the same groupings of feathers on the tail and wings. This correspondence carries over to other examples of the same subject, including a circa 1730 picture executed by Ann Marsh herself (see footnote 8). The five-pointed flower in the middle right section of the present picture is an additional motif that appears in the work of Ann Marsh and her students, and, as noted by Amanda Isaac, in Philadelphia silkwork in general (see footnote 9). Comparing details from the present picture and one of Sarah Wistar’s works at Winterthur, we find a particularly strong visual correspondence. 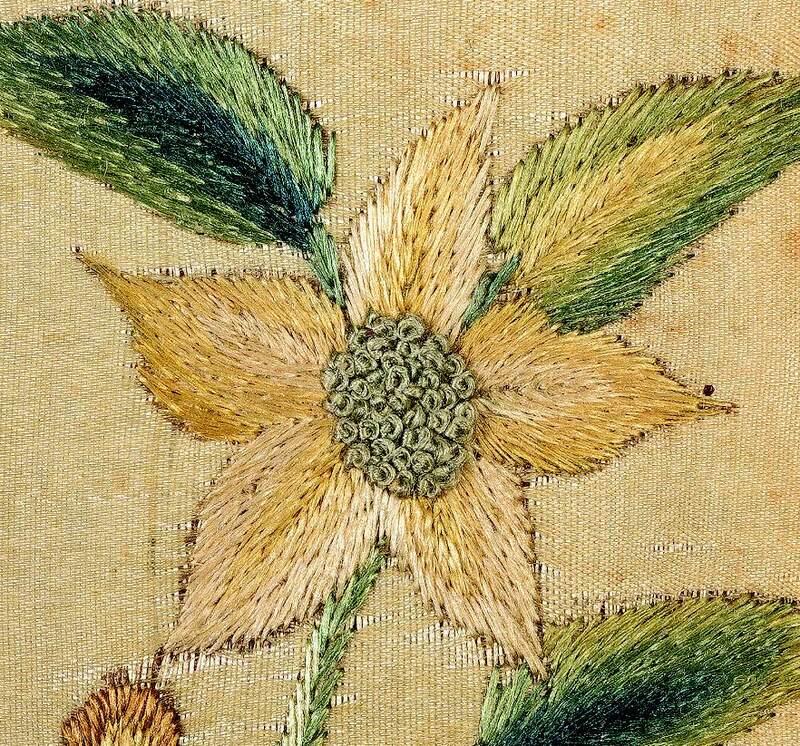 In each of the buff-colored flowers shown, the center is executed in French knots, and the smooth, single-lobed leaves are skillfully shaded using multiple hues of silk, suggesting yet another similarity between the piece under discussion and the needlework of Philadelphia. Despite a lack of genealogical or historical evidence to strengthen the proposed Philadelphia origin, these visual and technical points of comparison are compelling reasons to attribute the piece to the area. A connection to the Marsh school represents an even more tantalizing possibility: in the annals of American needlework history, Elizabeth Marsh is a major figure, credited with setting the course for the development of Philadelphia’s sophisticated style (see footnote 10). A confirmed connection to his teacher could strengthen our understanding of an important needlework school. Further, in this picture, we may have an unusual early survival of particularly elaborate work, challenging our assumptions about the level of accomplishment of women and girls of the era. 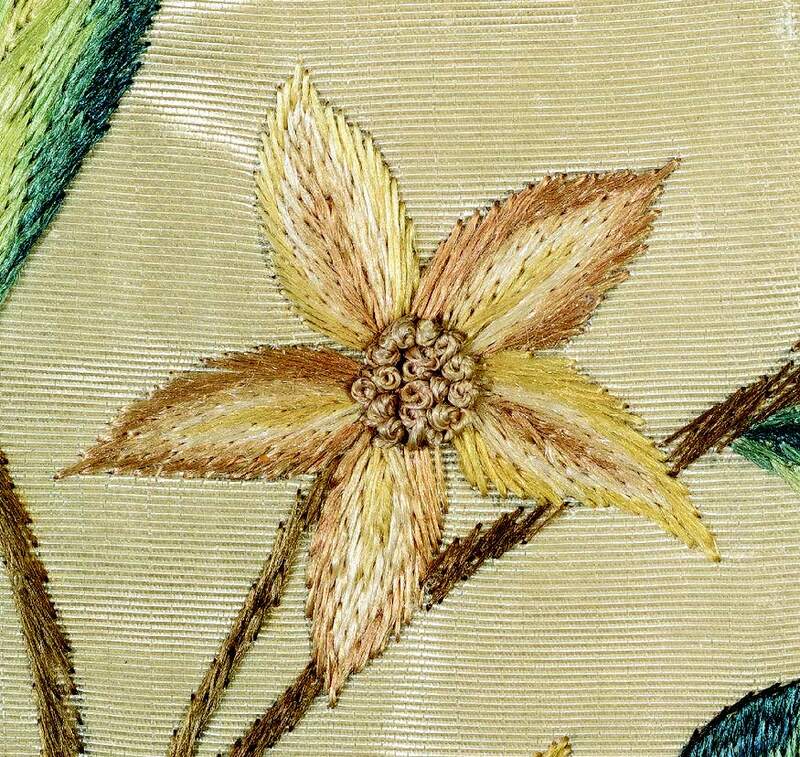 Needlework picture, detail, Sarah Wistar, 1752. Philadelphia. Museum purchase (1964.0120.002 A). Courtesy Winterthur Museum. A Winterthur Primer reprinted with permission from Antiques & Fine Art Magazine. Post by Emelie Gevalt, a second-year Lois F. McNeil Fellow in the Winterthur Program in American Material Culture. The resemblance to seventeenth-century needlework, coupled with the similarities to significantly later works, as discussed in this article, make it particularly challenging to date this piece. A wide date range of 1690–1740 is appropriate until further research can be done on needlework in the early colonial period. The piece descended in the family Harry M. Wilson of Cumberland County, New Jersey; Wilson’s great-grandfather was William Carlisle, who, according to a death record, was originally from Delaware. Although no definitive link has been established between William Carlisle and the Carlisles of Sussex County, Delaware, there are instances of both families using the surname Pemberton as a first name for their sons, suggesting a common ancestry. See the 1850 Maurice River, New Jersey, census record for William Carlisle, and Esther Littleford Woodworth-Barnes, “Captain Thomas Pemberton (ca. 1655–ca 1717) of Maryland and Delaware, “National Genealogical Society Quarterly: 265-269. Photocopied record, Family History Folders, “Pemberton.”Delaware Historical Society Research Library. For additional documentation of these findings and for further genealogical research, see Emelie Gevalt, “From England to Philadelphia: Distinguishing Influences from Origins in a Silkwork Picture,” Winterthur registrar files, 2016. I am indebted to Gloria Seaman Allen, Cynthia Steinhoff, and Amy Finkel for these suggestions, in email correspondence with the author, April 2016. Linda Eaton, in conversation with the author, March 2016. Linda Eaton, “Needlework and their Frames: Multimedia Objects. Winterthur Primer,” Antiques and Fine Art Magazine (14thAnniversary, vol. XIII, no. 1): 268–270. Further research is needed to determine whether these types of mounts are indicative of a specifically Philadelphia origin or simply of a Mid-Atlantic one. See Ring, 355, for the Ann Marsh sconce; see Winterthur object number 1966.1391A for another example of this subject. This entry was posted in Academic Programs, museum collection, needlework, Uncategorized and tagged embroidery, needlework, silkwork, Winterthur Museum, Winterthur Museum Garden & Library. Bookmark the permalink.